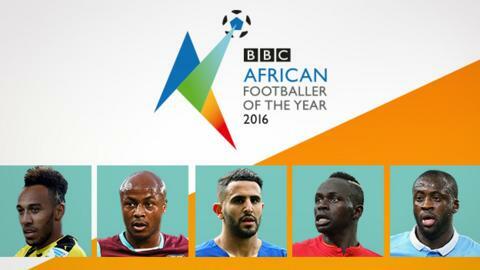 Voting for the BBC African Footballer of the Year 2016 has now closed. Fans from across the world have been voting for their favourite since the five-man shortlist of Pierre-Emerick Aubameyang, Andre Ayew, Riyad Mahrez, Sadio Mane and Yaya Toure was revealed during a special live launch broadcast on Saturday 12 November. Borussia Dortmund and Gabon striker Aubameyang is on the shortlist for the fourth consecutive year, while West Ham's Ghana attacking midfielder Andre Ayew - winner in 2011 - is also shortlisted for the fourth time. Leicester's Algeria forward Mahrez is the only player not to have been nominated before, Liverpool and Senegal striker Mane made his debut on the shortlist last year, and Manchester City's Ivorian midfielder Toure has featured for eight consecutive years and is a two-time winner. He became the first African to be named Bundesliga player of the year, the first Gabonese to become the Confederation of African Football's Player of the Year, and has earned a place on the shortlist for the 2016 Ballon d'Or. The 26-year-old's impressive performances, and his 12 goals in 35 appearances, earned him the title newcomer of the year at the Swans' end-of-season awards in May. Read a full profile of Ayew here. Another English Premier League player, Mahrez enjoyed spectacular success as he inspired Leicester - who had been 5,000-1 outsiders - to a first league title. Mahrez, 25, scored 17 league goals and was voted Professional Footballers' Association Player of the Year - the first African to win the award. He also starred for Algeria as they qualified for the 2017 Africa Cup of Nations. Read a full profile of Mahrez here. Read a full profile of Mane here. Toure collected yet another trophy in 2016 - the 17th of his career - when he lifted the English League Cup with Manchester City, scoring the winning penalty as they beat Liverpool in a shootout in the final. This was the year the 33-year-old powerhouse called time on an illustrious international career. But he declared he was still a force - and his inclusion on the list for another year backs that up. Read a full profile of Toure here.